Royal Canin Golden Retriever Puppy is a complete feed for dogs, specially for Golden Retriever puppies up to 15 months old. It helps support the skin’s 'barrier' role (exclusive complex) and maintain skin & coat health (EPA & DHA). Enriched with borage oil. Natural defences - this formula helps support the golden retriever puppy’s natural defences. Exclusive kibble - the kibble's shape, size, texture and formula are adapted to the golden retriever puppy. COMPOSITION: dehydratedpoultry protein, rice, maize, vegetable protein isolate*, animal fats, wheat,vegetable fibres, hydrolysed animal proteins, beet pulp, minerals, fish oil,soya oil, fructo-oligo-saccharides, psyllium husks and seeds, hydrolysed yeast(source of manno-oligo-saccharides), hydrolysed crustaceans (source ofglucosamine), borage oil (0.1%), marigold extract (source of lutein),hydrolysed cartilage (source of chondroitin). ADDITIVES (per kg): Nutritionaladditives: Vitamin A: 24400 IU, Vitamin D3: 800 IU, E1 (Iron): 40 mg, E2(Iodine): 2.8 mg, E4 (Copper): 9 mg, E5 (Manganese): 53 mg, E6 (Zinc): 198 mg,E8 (Selenium): 0.1 mg - Preservatives - Antioxidants. ANALYTICAL CONSTITUENTS:Protein: 29% - Fat content: 16% - Crude ash: 6.5% - Crude fibres: 3.8% - EPAand DHA fatty acids: 4 g/kg. 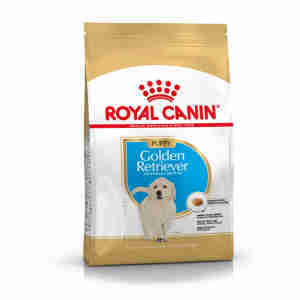 Billy loves Royal Canin Golden Retriever Junior. Billy loves Royal Canin. We tried the rest and Billy who is a very clever dog , will only eat Royal Canin Golden Retriever Junior.